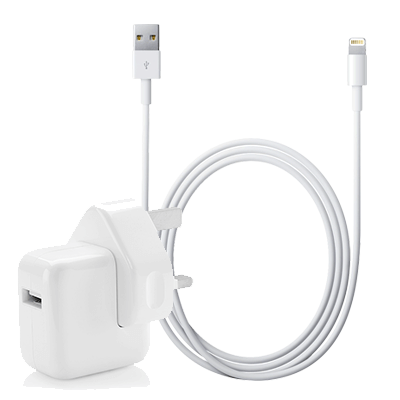 Apple iPad and iPhone charger bundle - includes an 8-pin Lightning cable for newer model devices and a 10W USB power adapter. This same bundle would cost you £38 in the Apple Store for exactly the same items. Ours come unboxed and saves you over 60%! Need a faster charger for your iPhone or a new iPad charger? Apple would only offer you a plug and cable as seperate items and charge you full price for each. We bundle the two items you need and discount the price! Is that good or what? Included in the bundle is an Apple 10w USB Power Adapter which can be used to charge iPads and iPhones or any other USB equipped device. We also include an Apple Lightning Cable which can be used with the power adapter for charging or can be plugged into your computer for data transferring between devices. These come bulk packaged. This means that they won't be in retail boxes. Really pleased with my purchase. Excellent charger,, would definitely recommend. Arrived the following day. I wil buy from this site again..
Absolute lifesaver! Left my charger behind while on holiday, suppose i deserve it for leaving everything till the last minute! this has saved me a fortune and it arrived next day. A GENUINE Apple iPad charger. I say GENUINE as so many offered for sale aren't! Fair price and quickly despatched. I was a little sceptical as to wether this would be a genuine product considering the great price but I'm very pleasantly surprised. Genuine article and brill price! Very happy.